Gawd, I’m lying in bed writing this feeling absolutely knackered and ache in places I never knew existed! 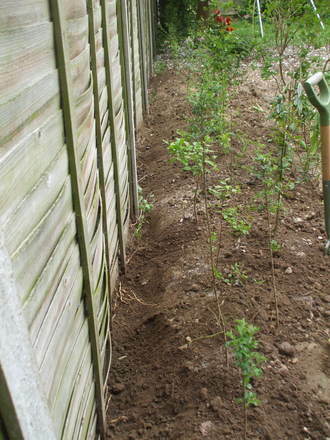 I managed to spend about 2 hours this morning, after having rested yesterday, attacking the bloomin’ bindweed. 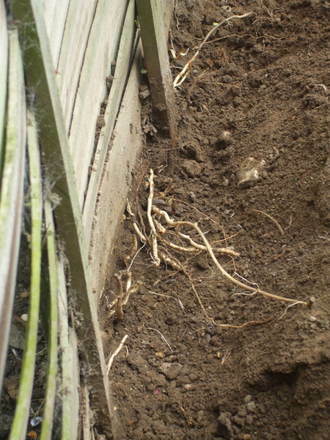 First, I dug a trench along the edge of the fence where the roots were coming thro’. 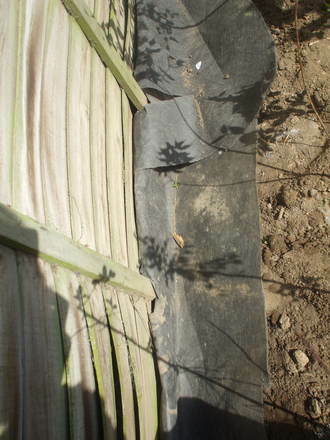 Then I cut some black membrane up, which I got from the builders merchants, very cheap. Never buy from a garden centre, soooo expensive. Then I cut it into as long a piece as I could, altho’ I had to cut another lil’ strip and overlay it. Then I cut down a little way and tucked the piece into each panel. 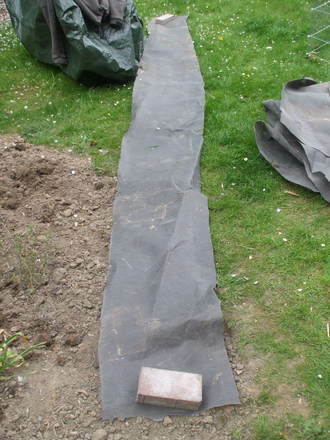 As for the other jobs I’d planned to do in the garden today, including watering, bugger that, they’ll have to wait, lol! Just had a packet of crisps and a kitkat, and just about to drink my big mug of very sweet tea! Phew! Next post: Oooooh! Decisions, decisions! Help! Hehe! Thanks Ian, that's put a smile on my face! Hubby has just bought me a big sweet cuppa tea, my 2nd! I've gotta do tea tonight, lol, but I don't think I'd be able to persuade hubby to water the plants tonight either, that would be my version of being pampered, lol!! hope you feeling revived now or do you need more tea!! 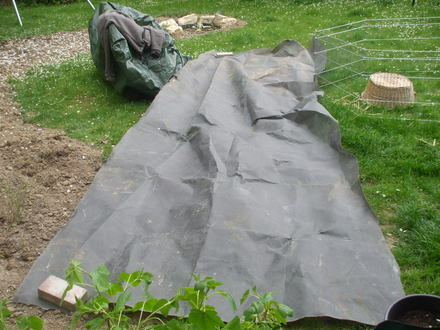 Mr Mad has done something similar this morning to stop the bindweed getting through from next door. It's a noxious weed, isn't it? Well done, you deserve a rest! ooh well done Craftnutter you deserve a medal, ive got something growing near my fences and near my ghastly oil tank which ive hacked at today should of taken a picture but will get depressed it its what you guys are struggling with!! think i'll have to do something similar at one end of my pond dig everything up and lay some membrane then put soil and plants back, oh what an awful thought! Now take it easy Craftnutter, you've over done and i bet you know it! Not easy to sit back though is it done it myself then regretted it next day when Menieres has attacked. Jeez, you've got a battle on there, hun. What a nightmare. I hope it works and the 'stuff' doesn't creep back underneath. Ah thanks everyone! You certainly cheered me up! Hubby actually helped me this morning, I think he felt sorry for me! 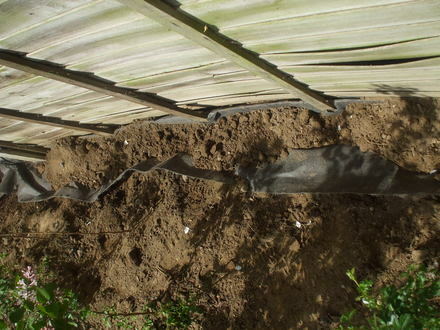 He put the soil back for me and dug over the bed, and we pulled up another 2 buckets of the bloomin' stuff. Hopefully, there shouldn't be any left!!! Yep, I love drinking tea, can't you tell! Lol!! My shoulders and back are very sore, so I've not done much today. Managed to water the hedging whips, so that's something! Hope this blog helps other peeps with the same problem! And that we manage to get rid of it and can concentrate on making our plants strong and healthy without the weed getting all the water and nutrients!